Whist is an extremely old game, dating back to the 1600s. Deriving from an older game called Ruff and Honors, Whist received a boost in popularity from a 1742 publication called A Short Treatise on the Game of Whist, written by a gentleman named Edmond Hoyle. Despite the high price of one guinea for what amounted to little more than a pamphlet, the work sold out. Hoyle followed up on A Short Treatise on Whist with another publication of An Artificial Memory for Whist, which, along with other essays on games such as Piquet, Brag, Quadrille, Chess, and Backgammon, helped establish Hoyle as an authority on games, to the point that “according to Hoyle” became general English slang. A Short Treatise on Whist remained the canonical governing document of Whist until 1864. As for Whist, it remained popular into the early twentieth century. It is the direct parent of Bridge Whist, which gave rise to Bridge and then Contract Bridge, the dominant social game of the twentieth century. Contract Bridge went on to influence countless other games, such as Spades. 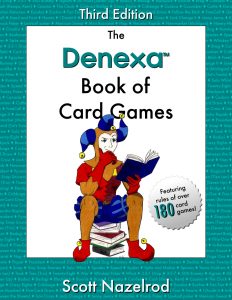 While Whist is nowhere near as popular as it was in the past, it still offers players the opportunity for strategic—some would say scientific—play, and serves as an excellent introduction to trick-taking games in general and Contract Bridge specifically. The object of Whist is to score points by taking the most tricks possible. Whist uses one standard 52-card deck of playing cards. 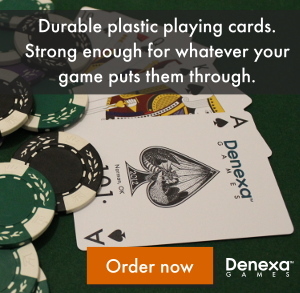 We’re not saying that a dragon will set fire to your coffee table if you don’t use Denexa 100% Plastic Playing Cards, but, hey, that’s never happened to someone who did use them. You will also need some manner of score-keeping apparatus, ranging from the humble pencil and paper to something more extravagant like bins filled with rubies, diamonds, and emeralds representing each trick won by a side. Actually, don’t use the latter as your score-keeping method. It’s super tacky and might make your friends suspect that you are part of some kind of illegal smuggling operation, tempting them to call the FBI tip hotline after the game if you win. The players divide into two partnerships, with partners sitting across from one another, so that the turn of play alters between partnerships when going clockwise. Shuffle and deal thirteen cards to each player. The final card of the deck, the dealer’s thirteenth card, is exposed. This card’s suit becomes the trump suit for the hand. This final card remains face-up on the table until the dealer’s first play of the hand, at which point it is added to the remainder of their cards in their hand. The player to the left of the dealer leads first. Each player to the left then plays a card. If able to follow suit, a player must do so. Otherwise, they are free to play any card, including a trump. The trick is won by the highest card of the suit led, unless a trump is present, in which case the highest trump wins the trick. Collected tricks are not added to the hand, but rather kept in a discard pile in front of one of the partners. Since it is important to keep track of the number of tricks captured, each trick should be placed onto the pile at right angles, so that the tricks can be easily separated after the hand. The individual player that won the trick leads to the next one. After all thirteen tricks have been played, the hand is scored by counting the number of tricks scored by each partnership. Each trick in excess of six counts for one point. Game play continues until a pre-defined number of points (such as 25) is reached.